Kanye's G.O.O.D. Music Associate Malik Yusef Denies ID Theft ... I'm Not Scamming Anybody!!! Malik Yusef says he was doing work on Kanye West's behalf to arrange a New York Fashion Week show but it didn't work out ... but it's definitely not the shady scheme it's being made out to be. We broke the story ... Kanye's G.O.O.D. Music associate is accused of forging the rapper's signature to strike a deal with Philipp Plein to stage a NYFW event with Ye performing, and then making off with at least $750,000. Yusef strongly denies those allegations and tells us it was business as usual as he negotiated with Plein to get some "futuristic t-shirts" at Fashion Week. He claims Kanye was aware of the pending contract, but when it became clear Ye wasn't going to perform ... he let Plein know the deal was off. Malik claims he didn't touch a dime of Plein's money and even sent it back to him. He's adamant he's not scamming anyone and points out he's been working with Kanye for years ... and they run a foundation together. Yusef insists he's never taken anything from Kanye, adding ... "I barely take his f***in' advice." On Twitter, he's also responded to a suggestion he might be getting set up, saying ... "Its actually less against me and more against @phillip_plein but I ain’t going either tho." Sources close to Kanye tell us a different story, though ... saying Kanye never committed to anything and had no idea about the show Yusef was communicating to Plein about. 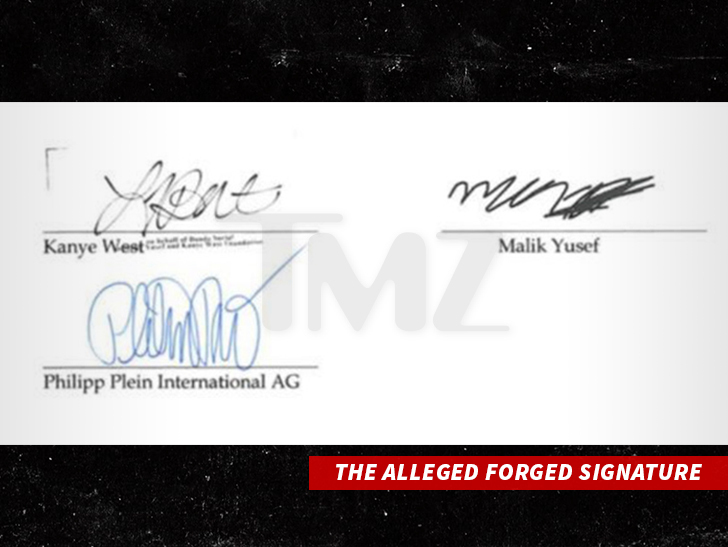 A rep for Kanye adds, "Malik Yusef is certainly in no position to negotiate a deal, receive money, or forge Kanye's signature or sign any contracts on his behalf."